This upper-division nursing degree program is for registered nurses (RNs) wishing to earn a Bachelor of Science in Nursing (BSN). 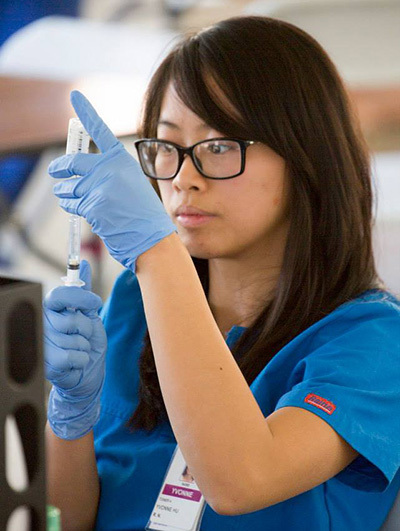 "I chose Cal State University of Fullerton's School of Nursing program because of the fluid transition between my ADN-RN program to BSN program. Applying and enrolling in this program after receiving my RN license was effortless with the RN-BSN advisor and staff's help and assistance. In addition, the option to be a distance student was perfect for me especially since I just began my first full-time RN job." The CSUF School of Nursing has partnered with community college Associate Degree in Nursing programs to help students prepare for transfer to the RN-BSN program. The CSUF School of Nursing has partnered with community college Associate Degree in Nursing (ADN) programs throughout California to help students prepare for transfer to the RN-BSN program. Please visit your counselor at your ADN institution for more information about requirements for the ADN program. It is important to visit your counselor at your current ADN institution to review your coursework for transfer. If you are interested in having your transcripts reviewed by our Pre-Enrollment Advisor, Laurel Replogle, please email nursing@fullerton.edu. Reviews may take up to two weeks.